There will be a few last minute tickets available on the day. Best to book via the website. Korting voor vaste bezoekers van Mike’s Badhuistheater! Krijg nu één week (tot 25 oktober) 5 euro korting op aankoop van een kaartje ‘Allo ‘Allo!. Dus het is nu maar 10 euro per kaartje. Reageer snel, voordat je achter het net vist! Michael Gove has hit out at TV shows and historians who depict the first world war as a “misbegotten shambles”. But does satirising or criticising the great war really denigrate ordinary British soldiers, as the education secretary claims? Click here for a wonderful thrilling teaser, made by Lulu Lightning. See you soon in Mike’s Badhuistheater! Open structured Easter campfire with the moon as the subject. East meets west: the moon. With theatrical extracts of Synges’ ‘When the Moon Sets’ and a short story by Italo Calvino. Live folk music and discussion. The role of the moon in human action as well as its relation to the construction of the East and the West with specific reference to how they appear in theatre and poetry. Western and Eastern values. The day of the event is Good / Bad Friday the fourteenth day of March in the Gregorian calendar or the first of April in the Julian calendar. On this day of all days, it so happens that orthodox and catholic Paschal Triduum fall on the exact same days with Passover preceding it by three days. This is a relatively rare event with it happening on average once every five years or so. Madhouse@Badhuis see this occurrence as an opportunity to complicate our understanding of the East/West dichotomy. The East/West bifurcation has been present in the structures of knowledge for centuries. This dichotomy has been central to how the self has been conceived dialectically in relation to ‘the other’. The expression ‘western values’ is a product of this framing. Madhouse@Badhuis brings you a night of theatre, conversation, poetry and music, where you are invited to participate, converse and create as we try to come to a deep understanding and reimagining of St. Patrick’s Day’s meaning, history and application which will be done through the collective practice of thinking, acting and music. This is done from a plurality of senses, identities, perspectives, knowledges and beliefs. St. Patrick, the patron saint of Ireland and Nigeria, is the character upon which the world’s most globalised national holiday is based. In Ireland the celebration of Christianity’s arrival takes place on the day of his death, the 17th of March. It is often assumed that the arrival of St. Patrick on the island of Ireland is inextricably linked to the variant of Christianity practiced in Europe during the Middle Ages and associated with the dominance of the centrally controlled Roman Christian Church and a hierarchical positioning of Nature, Human and God. The adoption of the flag of St. Patrick into the Union flag in 1801 adds credence to the idea that the ‘modern’ understanding of Christianisation is rooted in a will to ‘tame the ascetic’ and bypass how other forms of Christianity wrestled with Christendom, the dominance of centrally organised religion and the contruction of a dualism between man and nature. Thus, overlooked in St. Patrick’s day celebrations is the ascetic’s profoundly incommensurable relationship with nature, its individual connection to spirituality and the heterogeneity of deities practiced on the island of Ireland which intermixed with the version said to be brought by St Patrick. As Ireland had never been ruled by the Roman empire the blend of Christianity that unfolded in Ireland from 5th century took on many of the logics and affinities embedded in Celtic spiritual practices. Does the instrumentalisation of St. Patrick’s day in its current global manifestation represent the exclusion of other ways of being? Has it always done so? And if so, should it be a day of the mourning of the loss of the plurality of knolwedges by the nation state’s adoption of the day as its national holiday? Can it be imagined as a day of reincorporation of the lost knowledge of the ascetic and the occult? To complicate this, Badhuistheater, one of Amsterdam’s last upholders of the avant-garde, opens its doors to a St. Patrick’s evening offering a distinct alternative to the commercialised Paddy’s Day propounded by capitalist market logics and proliferated using simplified characterisations to sell merchandise and reproduce dominant orders of knowledge and being. This kind of ‘Paddy’s Day’ is easily accessed and serves as a mechanism of forgetting the complex and heterogeneous modes of spirituality and being. Madhouse@Badhuis brings you a night of theatre, conversation, poetry and music, where you are invited to participate, converse and create as we try to come to a deep understanding and reimagining of St. Patrick’s Day’s meaning, history and application which will be done through the collective practice of thinking, acting and music. Anyone is welcome to attend! You will also get a chance to be in the wonderful Badhuistheater in all of its surrealist and insane charm! Folk session music from the attendees. Bring a musical instrument! Click here to see a wonderful clip from the show (filmed last weekend). Get your tickets now before it’s too late! Meet all your favourite characters on stage! (Dutch tv has just started repeats of the original tv series.) 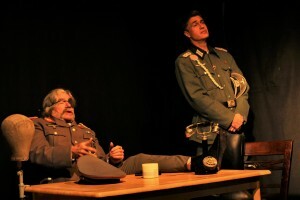 The play is set in the local town café in Nouviens in German-occupied France during the Second World War. René, the local café Owner, has many problems! The Germans are threatening to shoot him if he does not secretly hide their stolen goods; the Resistance is using the café as a safe-house for shot-down British airmen; and on top of that, he is trying to keep 3 passionate love affairs with his café waitresses secret from his wife. Sounds like a death sentence? All cultures get laughed at: the French / German / English / Dutch and Belgian. Nothing is sacred! And Helga loves Heer Flick, and Heer Flick loves Helga From the Badhuistheater International. (From the Sean O’Casey Dublin Trilogy. Our favourite dance party for people around the age of 40. Start fresh in the new year by dancing all of your sorrows away! Romeo and Juliet is Shakespeare’s most explosive poetic drama. He wrote it as a young man and it is full of murder, love and drama. Will Sutton makes a crime investigation karaoke in two parts over two weekends. Part 1 is on January 13, part 2 on January 20. More information will follow. Ofcourse we bring ‘Allo ‘Allo! back after the great success in november and 5 completely sold out shows! THE “CRAZY“ ENGLISH COMEDY, BACK IN 2017 FOR EXTRA SHOWS, AFTER SOLD OUT HOUSES! Meet all your favourite characters on stage! 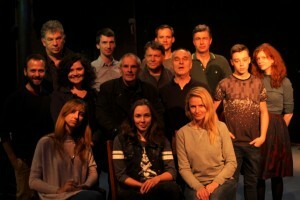 The play is set in the local town café in Nouviens in German-occupied France during the Second World War. René, the local café Owner, has many problems! The Germans are threatening to shoot him if he does not secretly hide their stolen goods; the Resistance is using the café as a safe-house for shot-down British airmen; and on top of that, he is trying to keep 3 passionate love affairs with his café waitresses secret from his wife. Sounds like a death sentence.? All cultures get laughed at: the French / German / English / Dutch and Belgian. Nothing is sacred! FROM THE BADHUISTHEATER INTERNATIONAL. THE SAME COMPANY THAT DID THE SEAN O’CASEY DUBLIN TRILOGY. 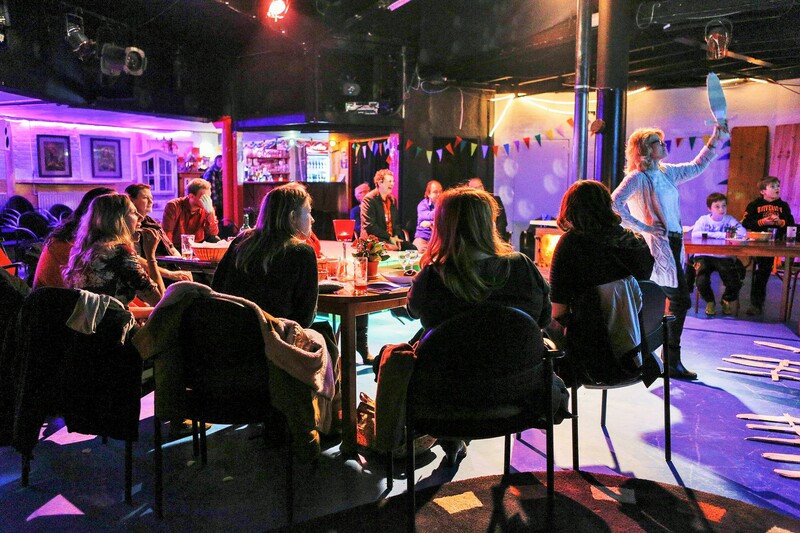 This week Mike’s Badhuistheater is home to a theatre group from São Paulo (Brasil). The members of the group have a mental handicap. These Thursday there will be a lovely visual en musical show. And Wednesday there will be an open rehearsal. Language is no problem, because it is only visual. We’re looking forward to it! There isn’t enough space for all people in the world. Some people live in limbo, between walls, others were thrown into the sea. A small group decides to board a ship in search of other worlds, of possibles, zero gravity… Utopia, evasion or lucidity? In the passage through sidereal Eden there is hybrid beings. A crack in the sky makes its appearance: a hint of a world about to collapse or open up to another dimension? The shaman friends of xapiri monkeys are invited to face this challenge. In the middle of clashes, fights, assaults, the fire of Nero, heads on trays, dances, new constellations emerge, conversations with stars.